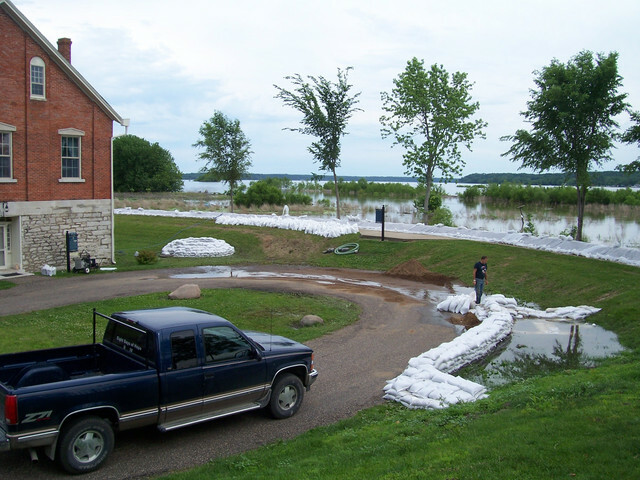 Volunteers are filling sandbags in and around Nauvoo, Ill., to protect historic church landmarks in the event of flooding on the Mississippi River. The National Weather Service issued flood warnings for areas along the Mississippi that stretch through Illinois and Missouri. BYU Folk Dancers, young performing missionaries, young sister missionaries, Nauvoo Restoration Incorporated employees and missionaries, and Illinois Nauvoo senior missionaries are working together to fill sandbags and protect the historic Nauvoo house and Niota, a small neighboring community. The area of Nauvoo closest to the Mississippi river is dotted with historic buildings originally built by Mormon settlers in the early 1800s. Restoration projects are operated by both The Church of Jesus Christ of Latter-day Saints and the Communities of Christ church. 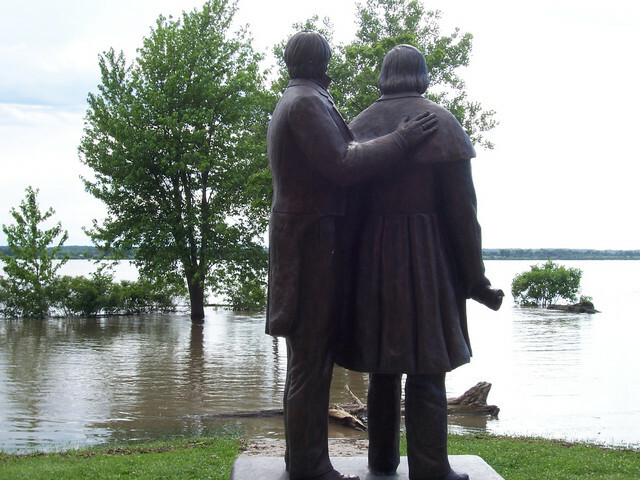 There are also some incredible photos of the rising waters, that are coming periously close to the Historic Nauvoo House and other areas of Nauvoo. Statement as of 9:35 PM CDT on June 16, 2008 … Flood Warning remains in effect until further notice… The Flood Warning continues for the Mississippi River at Keokuk ld19. * Until further notice. * At 8:00 PM Monday the stage was 26.0 feet… and falling. * Major flooding is occurring and record flooding is forecast. * Recent activity… the river is currently falling due to a levee failure near Gregory Landing. * Flood stage is 16 feet. * Forecast… rise to 28.4 feet Wednesday evening… then begin falling. * Impact… at 27 feet… water affects residences in Nauvoo and reaches the top of the levee protecting the historical Nauvoo house. 935 PM CDT Mon Jun 16 2008 … Flood Warning remains in effect until further notice… The Flood Warning continues for the Mississippi River at Burlington. * Until further notice. * At 9:00 PM Monday the stage was 25.4 feet… and rising. * Record flooding is occurring. * Flood stage is 15 feet. * Forecast… rise to 26.0 feet Tuesday evening… then begin falling. * Impact… at 26 feet… water reaches the top of the Gulfport town levee. Another interesting one–Brigham, where’d the road go? Here’s a link to the Weather Undergound site that has several such photos. I don’t know how far the Temple is from the river banks, perhaps some who are more familiar with the Nauvoo geography can fill in on that. Prayers and hope for everyone impacted by the midwest flooding. News From Nauvoo–a Blog focusing on Nauvoo News has a good write up and more great photos. Dave over at Times and Seasons has this post: Mississippi Rising, with a link the the Church Website that has an article and photos as well. geologist, so I’m really hip on this kind of junk. “kaboom!” Two of the six concrete silos collapsed. on my camera died while I was out and about. I’ll try again tomorrow. If I find more photos I will post them as well. Fortunately, the temple and the modern town of Nauvoo are located on the bluff about 100 feet above the river banks. I don’t remember noticing any levees at all around the flats where old town Nauvoo is – its seems like the river is just sitting there. Mormons all over the country are concerned about Nauvoo. Please keep bloging and keep us informed. I pray that everyone will be safe. Above all…..let God’s will be done. Mike Cornett, Vt. Vernon, Il. Thanks for the updates, Guy. I appreciate your earnestness. The temple is quite a ways from the river and, more importantly, higher, on a hill. However, I adore the old historical Nauvoo area and hope they can keep the flooding back. I lived in Nauvoo for several years. Nauvoo’s situation is a bit different than that of the surrounding communities, when it comes to potential flooding. In the 1993 flood (one foot lower than the worst projections for this year), the Nauvoo House was basically the only Nauvoo structure endangered, and sandbagging protected it. Even when nearby Niota is in flood-panic-mode, Nauvoo typically just gets some comparatively minor flooding on Water Street (right alongside the river) and the very end of Parley Street (near the statues depicted above). As a result, many Nauvoo residents volunteer to help sandbag in Niota during these threats, as the article mentions. Right now, I’m very concerned about my good friends in Niota, who’s home and business are likely to suffer damage. As someone else mentioned, the temple and the vast majority of Nauvoo’s homes and businesses are on the bluffs, well beyond any Mississippi flooding. Reports of sandbagging surely reflect caution, but they shouldn’t be taken to mean that the historical properties on the Nauvoo Flats are in any enormous danger. Nauvoo simply doesn’t get hit by floodwaters in the same way that Niota (9 miles north) or Keokuk/Hamilton/Warsaw (12 miles south) do. The only residential area of Nauvoo that could be flooded is actually north of the city limits, consisting of several homes built right on the riverbank. I suspect some of them are already having problems. I’ve also checked with a good friend who lives in Hamilton. The biggest problem right now in Nauvoo is that the “Great River Road” between Nauvoo and Keokuk/Hamilton is flooded out. That road is the major access between Nauvoo and the only currently-open bridge to Iowa within a hundred miles or more. There is a major “back road,” but it is under major construction at this time, so Nauvoo residents who need groceries (or in some cases, need to go to work) are having to take some very circuitous routes, if they can get to their destinations at all. Once anyone reaches the bridge at Keokuk, it’s down to one traffic lane, so wait times are up to an hour to cross. Thanks all for your comments, and insights, particularly those who are knowledgable about the city and what is or what is not at risk. Hopefully the river will crest quickly with a minimum of damage. Thanks for this information; I appreciate it very much. I am going to Nauvoo on Saturday morning with a couple of friends. We called the visitor center there and they said that they are still in good shape in Nauvoo and that roads coming from Quincy area are all still opened. Thank you to all for keeping us updated on that area. I am a member of the Community of Christ (RLDS)Church; I was an RLDS student historic guide in Nauvoo the summer of 1984 and I love Nauvoo & the history/heritage that we share there with the LDS. I recently found a video link from KSL-TV in Utah showing LDS & RLDS folks in Nauvoo working together to protect the historic sites there, even though the endangered bldgs are on RLDS property; it was very moving to watch, and comforting to know that the historic sites are being protected by efforts of people there from both churches…..THANKS!